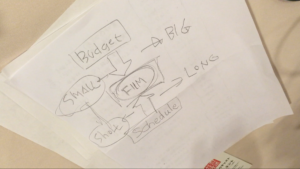 Kyle sits down with tokusatsu director Shinji Higuchi to discuss his career! Yatta!!! This is big news for me on a personal level. The subject of this episode is a man who I have been admiring for just about 20 years. 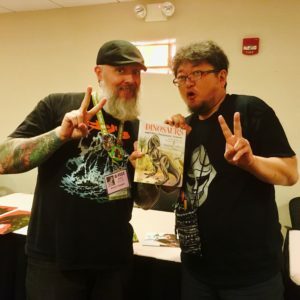 Higuchi has been in the kaiju scene for a looooooooong tong time, starting back in 1983 as a storyboard artist for Toho, he did some work on Return of Godzilla (1984) and eventually became the tokusatsu director for the aforementioned Gamera series and has been steadily making movies in Japan since. I was determined to interview Shinji Higuchi – the special effects wizard who I have been dying to speak with since I started the podcast. Big thanks to the G-Fest and the staff for helping arrange this interview, despite the universe’s attempts to defy us. Higuchi’s schedule was switched up at the last minute and the outlook was looking less awesome, but Tim Bean and Jeff Horne helped find a time that would work in the schedule. And Jeff even tracked down Mike Field, a fellow fan and attendee for his assistance — that’s right, even more kudos! Of course as many of us know, Shin Godzilla (2016) defied the trends Godzilla faced in the early 2000s and was a massive success in Japan, and has been playing well all over the world. If you ask me, we are all very fortunate that he’s come back to Chicago for another G-Fest and I couldn’t be more thrilled to finally have him on the podcast – maybe the stars will align and we can do this whole interview thing again in the future! 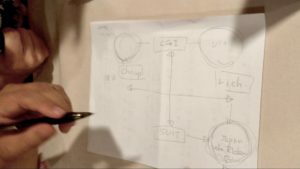 During the interview, Higuchi was making some diagrams to illustrate his points. I didn’t get them all, but I have a couple of photos of those notes he was making. 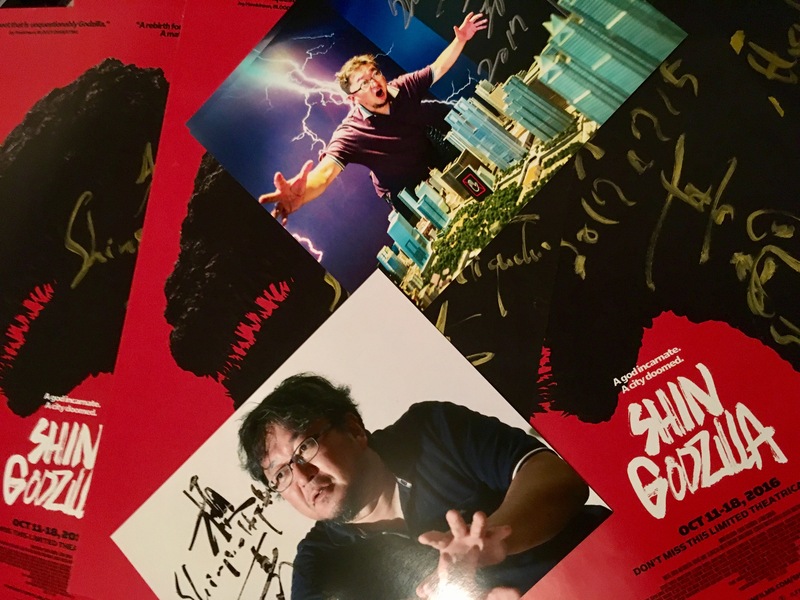 Unfortunately Shinji Higuchi had a little schedule mishap and had to leave G-Fest much earlier on Sunday – so there was a bit of a scramble on my part to find a time that would work for Higuchi’s updated and abbreviated schedule. Additionally, and almost just as important as having the director on hand, I needed to have an interpreter that could be there. I want to thank both Jeff Horne and Tim Bean for finding a time where I could steal Higuchi away. And I especially would like to give a major shout out to to my short notice translator, Mike Field….you are super awesome, sir! That’s right, we have a contest starting right now. Listen to the episode for details – the entry deadline is August 20th!